Just had some 'fun' quilting this lap quilt for my bedroom chair. It is a companion to the quilt I made for my bed. The colors on the picture are not quite right - it is snowing here today - but you can get an idea. 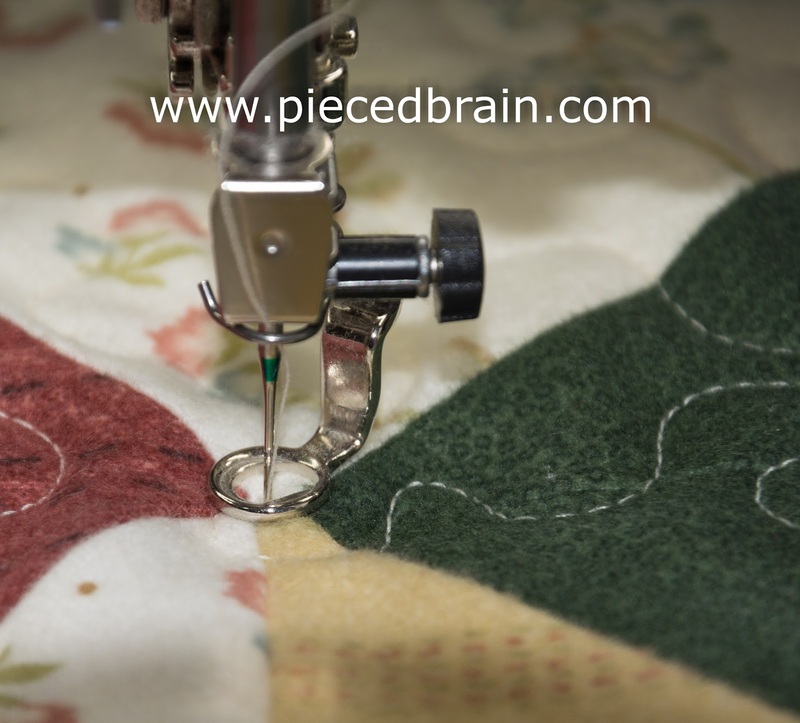 I started with a quilting foot but quickly switched to the darning foot because of its smaller footprint. It glided over bulky seams without disrupting the stitch length. The specs: Signature thread both on top and in the bobbin, Warm & Natural batting, with flannel backing (see it on bottom right of first picture). 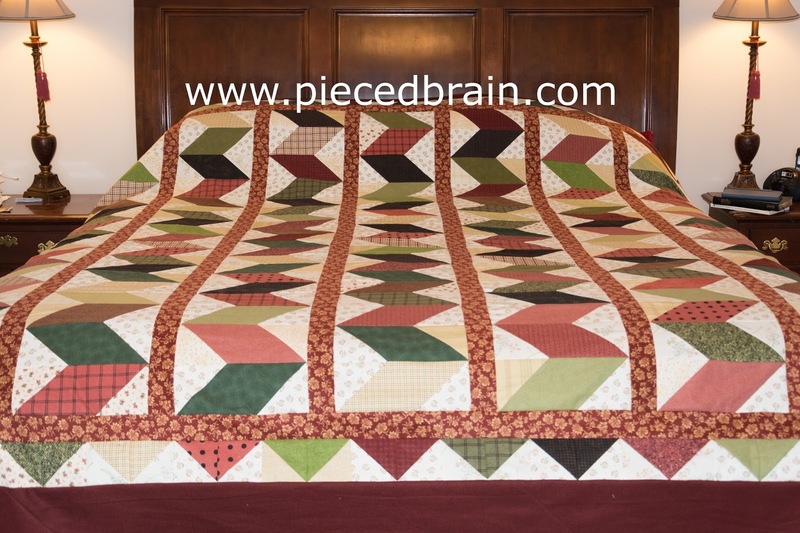 It measures 36" x 56" and was made using leftover half-square triangles from the bed quilt shown below. It will be perfect to cover my legs as I do handwork at night in my bedroom. When it is time to quilt the king size top shown at right (I keep referring to it as 'the beast'), I will definitely use the walking foot as I have done in the past, and will opt for simpler, perhaps straighter lines instead of curves. I am still trying to gather courage to finish it - put together the backing, make the sandwich, pin the heck out of it... For details about this pattern, see my previous post here, although I added the border before the red, outer border, to use some of the 280 half-square triangles I ended up with after making the quilt blocks. I will always have the lap quilt on the leather chair when the flannel quilt is on the bed. My next pair of quilts for my bedroom will be made of cotton, though. No plans for it yet as 'the beast' needs to be quilted first. I need encouragement. Help, anyone??? I hate the actual quilting part. I am a pretty good hand quilter (haven't mastered machine quilting) but I am always so anxious to move on to the hand work that I have many UFO's. I really like the flannel quilt on your bed. I bet it's cozy. very nice Denise!! 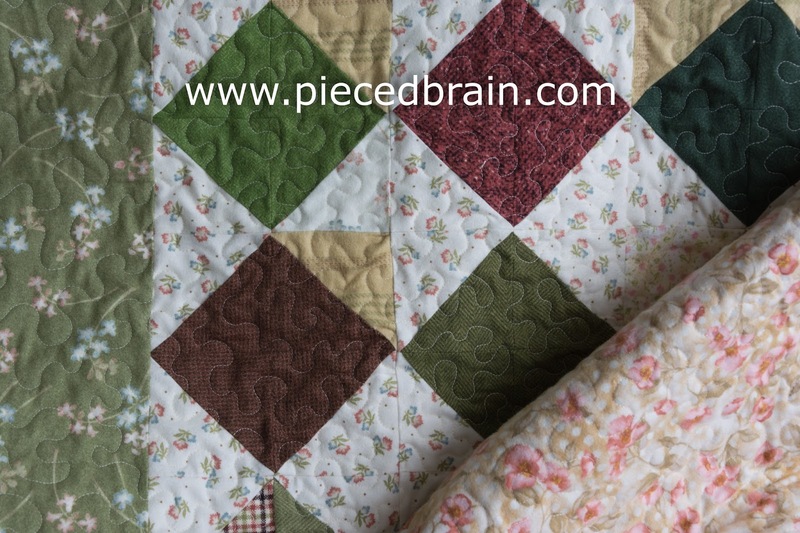 I have only machine quilted on flannel..it was wool flannel and it went so nicely. I found it so very soft and easy to work with. Your quilt is pretty colors too. Hello Denise, I am Dasha and Jan at Sew and Sow Farm is sending her followers around on a blog hop, so here I am to visit. Love the colours you chose for the flannels. It is no fun machine quilting a king-size quilt on a home sewing machine--take it from one who knows. I like the idea of your using your walking foot. I would stitch in the ditch along the zig zags and along the sashing strips. Then maybe across the columns too, because I think you need some stitching across the quilt. Good luck! Olá!Passei para uma visitinha rápida,espero que esteja bem.Ando sumida trabalhando muito.beijoGRANDE!